Coming up with a continuous stream of engaging topics to write about on your blog is easier said than done. Blogging beginners and seasoned bloggers alike struggle to come up with a steady flow of brilliant blog post ideas. 1. Keep an ideas file. Ideally, you should store this somewhere digitally so you can access it anywhere, anytime inspiration strikes. Evernote, OneNote, Google Drive, Dropbox, or similar services are all great solutions for storing an ongoing list of ideas you can add to over time, from whatever device you have handy at the moment. 2. Get other team members involved. Customer support reps are the ones in contact with your customers day in and day out; they know the most common challenges your customers are facing. So, get them engaged in the process by asking what questions they hear most often and what frustrations or challenges customers experience most frequently. Not only do you get great blog post ideas out of the exchange, but you might alleviate a bit of the customer support burden by helping customers solve common challenges before they ever call your customer service line. 3. Think about your past failures or challenges you’ve overcome. Readers love a good story, so draw from your past experiences to share your triumphs, failures, and lessons learned. For example, Yousuf Rafi shares 7 important life lessons learned in 5 years of blogging in this post at JeffBullas.com. 4. Conduct a survey. Why not ask your audience directly what they want to learn about on your blog? Or, conduct a targeted survey and formulate a post around that data, like Smart Insights does in this post. 5. Think about industry trends. What’s the driving force of change in your industry today? What trends are changing the way you do business? Dedicate a blog post to discussing each of these trends in depth, or consider creating a roundup-style post like this one from Coredna. 6. Revisit your past blog posts. What did you write about one, five, or ten years ago? Consider writing a look-back post and discussing how much things have changed over time. 7. Repurpose your old blog posts. Repurpose your old posts into something new, like a historical timeline or a collection of lessons learned. 8. Tie your hobbies in with your industry. You’ve seen these posts before – the “7 things I learned about sales from knitting” type of post. What do you do in your spare time, and what takeaways do you apply to your professional life? 9. Tie current pop culture in with your industry. A similar strategy to the hobbies brainstorming trick, think about how to tie current pop culture trends in with your niche. Instead of “7 things I learned about sales from knitting,” how about, “7 things we learned about networking from Avengers: Infinity War“? 11. Put a negative (or positive) spin on it. Another way to expand your thinking is to put a positive or negative spin on every idea. If you’ve already written about “10 things every entrepreneur must do before 8:00 a.m.,” why not write about “10 things every entrepreneur must never do before 8:00 a.m.”? 12. 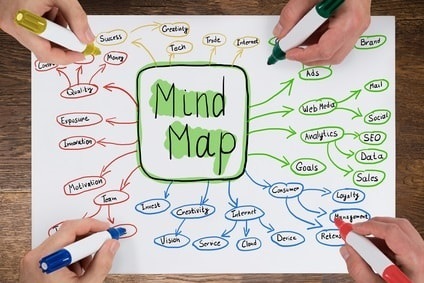 Create a mind map. Start with a central topic or concept, and break it down into subtopics. Then, break each subtopic down into subtopics, and so on, getting more specific with each level. Once you’ve gotten as specific as you can, you’ll find that you’ve created a list of possible blog topics. 13. Instead of making a list of possible topics, make a list of people you could interview. That list could include key customers, industry influencers, or team members. Not only can you use interviews as blog posts, but the different perspectives you’ll get from each interview subject is likely to inspire additional blog post ideas. 14. Read the comments on your past blog posts. Read your blog comments section. You’ll probably find that your audience is supplying you with a wealth of ideas for future posts. Even if they’re not outright asking a question you can answer in a blog post, you can find out what topics are most interesting to your audience and expand on those concepts in future posts. While your blog comments may directly influence your search engine rankings, they provide excellent fodder for brainstorming new blog post ideas. 15. Tap into your social media audience. Your readers aren’t only engaging with your content in your blog comments section. Monitor your @replies on Twitter, comments on your Facebook or Instagram posts, or discussions on your LinkedIn page for more ideas. Use social media management tools to better monitor brand mentions and topics across the popular social networks. 16. Spy on your competitors. What are your top competitors or like-minded bloggers blogging about? Think about ways you can put a different spin on topics they’ve covered. 17. Piggy-back on topics covered by mainstream publications. Think news outlets like USA Today or even magazines like Men’s Journal or Cosmopolitan. Take a look at the recent articles they’ve published, and when you find something you can tie in to your industry, run with it. 18. Check out lists of writing prompts. Draw from writing prompts, such as this massive list of 189 blog post ideas from CoSchedule, to get inspiration for new blog topics. You’ve probably already tackled a few of these ideas if you’ve been around the blogging block a time or two, but with nearly 200 ideas to choose from, something here is sure to strike a chord and get the creative juices flowing. 20. Ask your social media followers a question. Asking open-ended questions like, “What’s your biggest content marketing challenge?” gives you plenty of blog-worthy topic ideas based on your followers’ responses. Questions also encourage engagement on your social media pages, which in turn can boost your organic visibility. 21. Browse your Facebook news feed. If you follow industry thought leaders or publications, your news feed is a good place to discover the latest news and insights your readers might also have an interest in learning about. 22. 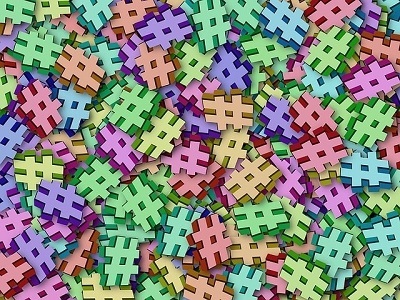 Follow relevant #hashtags on Twitter. Search for relevant hashtags to find out what Twitter users are talking about related to your topics of interest. You might discover newsworthy happenings or uncover questions or frustrations you can address in your next blog post. 23. Find out what questions people are asking industry influencers. Turn to the social media profiles of industry influencers and see what questions their followers are asking them. Make a list of questions you can answer in future blog posts. 24. Make note of topics discussed by industry influencers. Speaking of influencers, you’re not limited to the questions others are asking them – look at the recent topics they’ve posted about. Chances are, you’ll find something relevant you can discuss in a blog post. 25. Find popular YouTube videos. Search YouTube for industry terms and take a look at the videos with the most views and comments. The topics of those videos can make great blog posts. 26. Take a stroll through the comments section on recent articles from industry blogs or publications. The comments section can be quite telling, particularly on controversial subjects. You might discover a widely held belief among your target audience that you can debunk in a blog post. 27. Visit the Facebook page or Twitter profile for industry blogs or publications. Conversations about recent articles are taking place on social media, too, so gauge reactions and opinions by reading through comments on Twitter and Facebook, as well. You can get great blog post ideas from these reactions, or you can summarize widely held opinions and add your own commentary in a blog post. 28. Listen to podcasts. Subscribe to a few niche podcasts – or even general podcasts – and listen during your commute or in your free time. Just listening to conversations and interviews can inspire some great blog topic ideas, or you could summarize a favorite episode and add some commentary. Not sure where to begin? Check out The Stitcher List, a weekly ranking of the most popular podcasts on Stitcher. 29. Follow influencers on Instagram. Instagram feeds and comments are a wealth of inspiration when you’re looking for new ideas for blog topics. Follow influencers and read their feeds and comments to gauge what their followers are talking about most. 30. Look at the FAQ sections on your competitors’ websites. FAQ pages are excellent sources of content ideas, as they’re often based on questions asked by customers. Chances are, your own readers have some of the same questions, and you can help to solve their problems by addressing those questions in a blog post. 31. Attend industry conferences. Industry events, such as meetups and conferences, are often where you’ll find out about new product releases and innovations, plus you can attend training and rub elbows with thought leaders and industry peers. From discussing up-and-coming products and services, summarizing lessons learned or the latest trends, or roundup posts with your top 10 takeaways from an event, industry conferences and events provide practically endless inspiration for blog post ideas. 32. Explore Reddit. Reddit is one of the oldest, widely-adopted internet discussion forums where users can share, discuss, and vote on content. Reddit first launched way back in 2005, and the site now has hundreds of thousands of topically-focused subreddits where like-minded users converge and discuss the things that interest them – from the mundane to the controversial and even the totally bizarre. Subscribe to subreddits in your niche to keep a finger on the pulse of what the internet is talking about. New to Reddit? Check out this Beginner’s Guide from Digital Trends. 33. Browse relevant topics on Quora. Quora is a Q&A-driven site with hundreds of thousands of topics. Search for topics that interest you and discover what questions people are asking, paying special attention to those that have lots of followers and/or responses. Then, craft a blog post answering a popular question. You can even use Quora to write your blog post. 34. 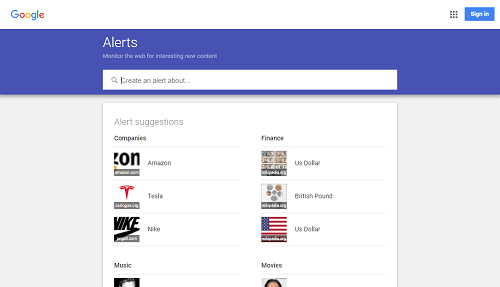 Sign up for Google Alerts. With Google Alerts, you can monitor the web for new content about keywords and topics that you (and your blog readers) are interested in. You’ll get those notifications right in your email inbox, either as-it-happens, once a week (at most), or once a day (at most) – your choice. As those alerts come in, you can news-jack the most newsworthy topics or write a post with commentary about whatever’s happening in your space. 35. Check out your Facebook Audience Insights to learn about your audience’s other interests. Facebook Audience Insights could be your biggest untapped resource if you’re not using it to generate new blog post ideas. What posts have gotten the most engagement from your followers in the past? Turn those engaging topics into new blog posts by approaching the subject from a different angle or examining the subject in greater depth. 36. Use a blog title idea generator. These nifty tools are valuable resources for the blogger with writer’s block. FATJOE’s Blog Post Title Idea Generator, for instance, generates a variety of complete blog topic ideas based on a simple keyword search. Other blog title idea generators include Portent’s Content Idea Generator, SEOPressor’s Blog Title Generator, and HubSpot’s Blog Topic Generator, among others. 37. Use Google Trends to identify spikes in interest. Like Google Alerts, Google Trends is a useful Google tool for powering content creation. With it, you can find out how interest in particular topics has changed over time – and when you find a topic or keyword with a sudden spike in interest, you’ve found yourself an excellent blog post topic. For example, check out the Google Trends graph above showing interest in Little League over a 90-day period from mid-May to mid-August 2018. 38. Check out related queries and topics in Google Trends. In addition to searching for relevant topics to identify spikes, the related topics and queries that come up when you search Google Trends are a goldmine of new blog topic ideas. 39. Explore Google Trends Latest Stories and Insights. On the front page of Google Trends, you’ll find information on some of the biggest current trending topics. For example, currently a story on Back to School is featured. Click through to the story and you’ll find a wealth of information that can fuel blog post ideas, such as the top searched school supplies over the past 30 days, the top “for school” searches over the past three months, trending related searches over the past week, and top questions related to school over the past week. Not only are there many workable blog post topics here, but you’ve got some ready-made keyword research at your fingertips, too. 40. Leverage “related searches” in the Google SERPs. When you search for a keyword in Google, at the bottom of the search results page, you’ll find a section that says “Searches related to [your keyword].” These topics often make workable blog post topics. For instance, a search for “blog post ideas” brings up related searches such as, “blog post ideas for students,” “blog post ideas for beginners,” and “fashion blog post ideas.” While all of these suggestions may not be a good fit, they can also inspire you with a spinoff idea or related concept. 41. Use the “people also ask” questions in the SERPs. Also in the Google search results pages, you’ll typically find a section titled “People also ask,” which lists several questions that searchers also search for related to your query. For example, we searched for “how to write a blog post,” and the People also ask section lists questions such as, “How do you start a blog post?” and “How do you make money writing a blog?” And, if you click to open a question listed, you’ll get even more commonly asked questions to fuel more ideas. 42. Make friends with BuzzSumo. BuzzSumo is a favorite tool among SEOs and content marketers. It functions similar to a search engine, but instead of bringing up a list of search results, it brings up the most-shared content related to a particular topic or keyword. Take a look at the most-shared content and think of ways you can make it bigger or better. 43. Use HubSpot’s brainstorming spreadsheet. While it taps into some similar tricks we’ve already mentioned in this list, HubSpot’s Content Brainstorming Key provides structure and guidance that keeps your creative juices flowing until you’ve generated several blog-worthy topics. 44. Use your ShareThis Social Analytics Dashboard. Your ShareThis Social Analytics Dashboard reveals your most-shared pages over the past day, the past week, and the past month. It’s a great tool for gaining a bird’s-eye view into the content that’s resonating most with your readers so you can expand on those engaging topics in future posts. 45. Use content curation tools. Content curation tools are helpful for discovering relevant industry content. Browsing popular topics and titles can inspire you with new blog topic ideas, but you can use these tools to create curated blog posts, as well. For instance, you could write a top 10 roundup of other articles on a particular topic. 46. Leverage Answer the Public to find keyword-related questions. Simply enter a keyword in Answer the Public and get a list of questions you can base blog posts on, grouped into categories of questions beginning with what, where, when, who, why, are, which, and how. 47. Use FAQ Fox to find questions across sites like Quora and Reddit. If you don’t have tons of time to subscribe to subreddits on Reddit or browse topics on Quora, FAQ Fox is here to save the day, scraping Q&A sites across the web to find questions related to your topic or keyword. 48. Set up Feedly to keep tabs on topics that matter. With Feedly, you can select topics that interest you and your readers, and keep tabs on the latest blog posts, publications, YouTube channels, tweets, and even keyword alerts to get inspired with blog post ideas that hit the mark with the latest news and happenings. 49. Search the Ahrefs Content Explorer. Ahrefs lets you search for the most popular content based on organic traffic, backlinks, and social shares, making it a useful tool for identifying blog topic ideas that are practically guaranteed to generate results. This isn’t a free tool, but you can get a 7-day trial for $7. 50. Don’t forget about the Google Keyword Planner. You might think Google’s Keyword Planner is just for finding keywords for SEO or for your Adwords campaigns, but it’s actually a great resource for finding blog topic ideas. When you search for a main keyword, you’ll get a long list of short- and long-tail keywords, many of which you can craft a blog post around.